Oakland Transportation Management Association along with the Oakland Business Improvement District have created a unique piece that covers everything related to the Oakland neighborhood; from where to shop, where to enjoy a delicious meal, to providing navigation and transportation options to aid in your exploration. If you would like to receive a copy or a large quantity of the OSDE guide, contact Jina O’Neill at joneill@otma-pgh.org OR (412) 687-4505. 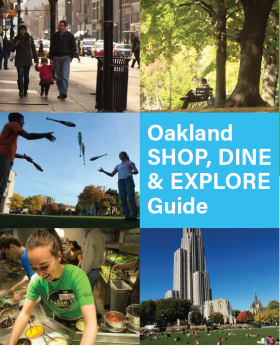 Please note: The Oakland SHOP, DINE, EXPLORE Guides are free of charge and must be pick up at the OTMA/OBID offices.